Unifor President Jerry Dias, center, announced the tentative contract early this morning nearly a half hour after the deadline passed. Canadian union Unifor faces just one more hurdle before it can wrap up this round of labor talks with the Detroit 3: Persuading its members to ratify a tentative deal with Ford. Ford Motor Co. reached a tentative labor agreement with Unifor early today that includes C$700 million ($522 million) in investment commitments at the automaker’s Canadian facilities. It includes a commitment for a “major engine program” at the Essex engine plant in Windsor, Ontario, fulfilling a key goal for the union, which has sought investments from each of the Detroit 3 automakers. But it remains unclear if the tentative agreement will be ratified. Workers were set to vote on the contract on Saturday and Sunday. At issue is whether workers at the Oakville, Ontario, assembly plant will sign on to the deal. Local union leadership at the plant, which employs about 5,000 hourly workers and constitutes the majority of Ford’s Canadian workforce, indicated last month that a deal modeled after the contracts with General Motors and Fiat Chrysler, such as the tentative Ford deal, would not pass at the plant. The contracts with GM and FCA were ratified relatively easily, with at least 65 percent support among Unifor members. Most of the deal’s investments will be in Windsor, where a new engine program will be implemented as soon as 2018. Dias said the engines will be featured on some of Ford’s top-selling vehicles, though he declined to discuss specifics. Union leaders declined to discuss many of the deal’s details, saying it will disclose them to its members before it does so publicly. 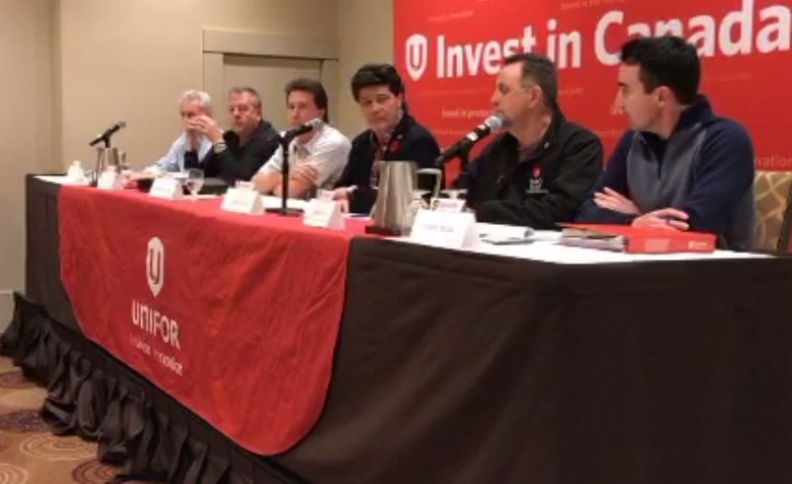 Unifor has repeatedly made securing product and investment commitments from the Detroit 3 its top priority in negotiations. Combining the tentative Ford deal with the GM and FCA contracts, the automakers have committed hundreds of millions of dollars to their Canadian operations. The deal is patterned off the agreements with GM and FCA. Under those agreements, workers will receive a $6,000 signing bonus, legacy workers will receive a 4 percent raise over the life of the deal and new hires will get wage increases each year under the 10-year grow-in period, which remains in place. The deal was reached after Unifor said Ford expressed concerns over the changes to the 10-year grow-in period. Under the pattern, new hires receive pay raises each year as opposed to a three-year wage freeze under the previous contracts. Unifor said Ford expressed skepticism about the new grid because of the roughly 1,000 hourly workers it has hired at its Oakville, Ontario, assembly plant since 2014. Dias said the Windsor engine plant will continue to build 6.8-liter V10 engines under the contract. While those engines are expected to be phased out over the next several years, Dias said he expects production to continue until the next round of negotiations in 2020. It was not immediately clear if Unifor was able to secure the jobs in place at the Windsor plant. Dias said there will be a “transition” for workers at the Windsor plant as the new engine program in Essex begins. He said he expected the total number of employees at the Windsor engine plants to grow as a result of the agreement.